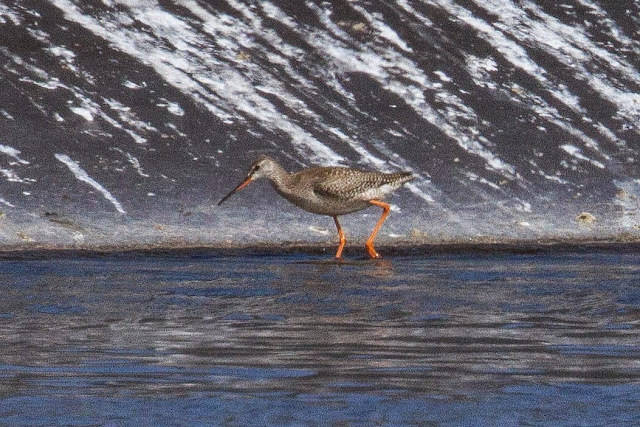 The Naturalest Naturalist: MEGA: Hawaii's First Spotted Redshank! MEGA: Hawaii's First Spotted Redshank! You know the saying "Go big or go home"? Well, I defied that by going big, then going home. I was in Hawaii visiting friends and enjoying its amazing natural and not-so-natural history from October 24th to November 8th, and boy did I ever make it memorable! On November 2nd, I was hiking the incredible Pu'u O'o Trail off the Saddle Rd. that traverses the Big Island between Mauna Kea and Mauna Loa. I had the good fortune of bumping into Jack Jeffrey - a well-respected ornithologist and photographer in Hawaii - and he mentioned the Kona Wastewater Treatment Plant is a great place to search for migrant waterfowl and shorebirds. There is almost an irony in this recommendation, as Jack's central focus is native forest birds. Regardless, I immediately decided it was a place I wanted to visit. Despite seeing some of the incredible native forest birds that are too gawdy for words, I found there was also something equally incredible about seeing migrant waterfowl and shorebirds, ones I see here on southern Vancouver Island, way out in the middle of the Pacific Ocean. How they manage to find terra firma when the nearest major land masses are thousands of kilometres away is beyond me. That was the major stimulus for following Jack's advice to hit up the Kona Wastewater Treatment Plant on November 3rd. The treatment plant is not open to the public, but birders have graciously been allowed to venture around the facility, staying outside the chainlink fence. Janean and I ventured in and followed a dirt road onto a dyke that offered a good vantage of the wastewater treatment ponds. Scanning the edges of the ponds, I found many of the expected Hawaiian marsh birds: Hawaiian Stilts, Hawaiian Coots, Pacific Golden-Plovers, Ruddy Turnstones, Sanderlings, and a few Wandering Tattlers. Additionally, I spotted a lone Cackling Goose that has apparently been a long-staying uncommon bird, plus a single Lesser Scaup. I also spotted a large wader in the corner of the furthest back pond on the left (i.e., southwesternmost). The heat haze was horrid and I figured it must be a Greater Yellowlegs, which would be a pretty good bird. I tried my best to get good looks from the dyke, but the heat haze was too strong. I got distracted by a small tern flying over the ponds and my attention was focused on it for a while. Even my views of the tern were unsatisfying, but I managed to ascertain that it was a Least Tern. A look on eBird confirmed that a juvenile had been reported there within the past month and since then I have learned that Least Terns actually bred in the area. Coming from the wet Hilo side, the dry Kona heat not only made the viewing conditions difficult, but it spurred me to move on because Janean is quite fair-skinned. Oh... and we were at a wastewater treatment plant in Hawaii. How fair is that?!? I gave one last look at that large wader and just had to shrug. "Probably just a Greater Yellowlegs" I thought, but there was something that didn't sit right with me about it. The legs seemed quite bright even through the haze. I knew I would be coming back to Kona on the last day and I would have the whole afternoon to explore the area. Janean is very accommodating and said I could go back on our last day. November 7th was our last full day and we weren't scheduled to fly until 12:50 a.m. on the 8th. We worked our way towards Kona in the morning, heading north from Ka'u. We had a fairly leisurely morning, including stopping in for a nice coffee and using some WiFi, so we didn't get to the treatment plant until noon. Janean said she would rather just relax in the car so she didn't feel like she was rushing me - what a lucky guy! I marched out to the dyke and set up the scope, hoping the "vog" (volcanic fog) would cut the haze. The large wader was in the exact same spot, but the heat haze still hampered views. I scoped around quickly for anything else unusual and then focused back on the wader. It moved up out of the water and onto the black plastic lining, which provided a much better contrast to evaluate the legs. I thought "Man... those legs are glowing!" I packed up the scope and decided that I had to get closer to see if there was any chance it was the outrageous thing I thought it might be. I skirted the facility to the left of the entrance and got to a place that was much closer and hopefully still offered a view of the bird. I set the scope up and started scanning... no dice. I figured it was just out of view, so I waited a minute and checked again. There it was... creamsicle orange legs just screaming "Hey dummy... my shanks are red!" I started to piece together the other features I knew off the top of my head: the basal half of the bill's lower mandible was reddy-orange, the overall colour was tan-brown with the speckled pattern reminiscent of a yellowlegs, it had white supercilia and dark lores, and the neck down to the belly had a tan wash, including blurry streaking on the upper chest. There was something else I was supposed to look for... right, redshanks are supposed to have a white wedge running up the back, in the same vein as dowitchers, I watched the redshank as it bobbed its way along the edge of pond. I was hoping the Hawaiian Coot would be curious enough about the foreign visitor to peck at its legs. 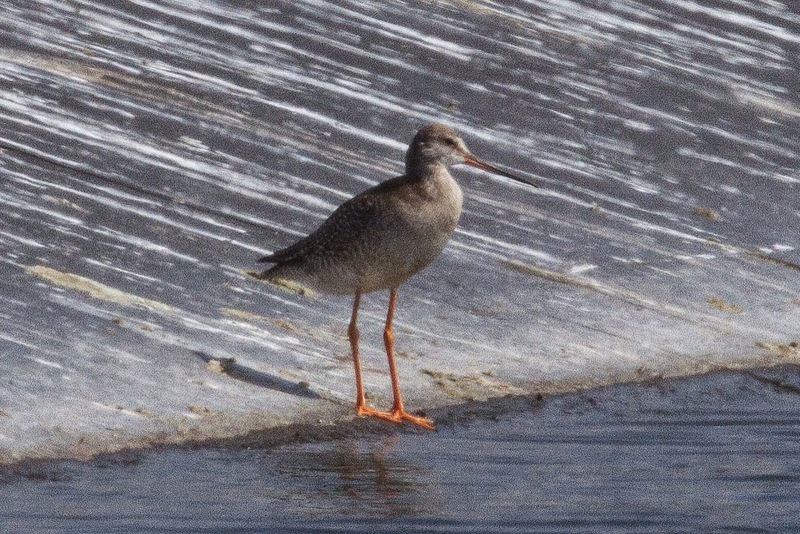 Instead, the noisy activity of a nearby Hawaiian Stilt caused the redshank to make a short flight. 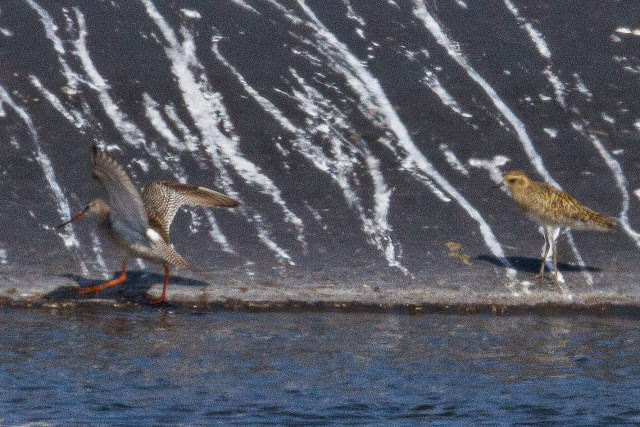 As its wings opened, the white patch was revealed up the back and, to separate it from Common Redshank, it lacked broad white trailing edges on the wings. I was looking at a juvenile SPOTTED REDSHANK!!! I guarantee I was muttering expletives to myself and I was certain this was a mega rarity for Hawaii. I wasn't sure exactly how good it was, but I knew it was going to cause a stir. So, I had just seen a Spotted Redshank in Hawaii and I had no idea what magnitude the rarity was and I wasn't sure who to contact. My only attempts to contact locals failed, so I did the next best thing: social media. I contacted Jeremy Kimm and asked him to put the word out on the ABA Rare Bird Alert page on Facebook and anywhere else relevant. He did just that and the more relevant page he got it on was the Hawaii Birdwatching group on Facebook. From there, enthusiastic local birder Lance Tanino grilled Jeremy K. for more details. It was, after all, a Hawaiian first - that's when I truly grasped the weight of the sighting. I called Jeremy to get all the information out in a prompt manner and this convinced Lance and also Jean Campbell that they should be there first thing in the morning the next day. I was grateful to Lance and Jean because they got down there and photo-documented the bird. My camera was out of commission, so I wasn't able to document the bird. They both managed to obtain tangible evidence that it existed and soon more Hawaiian birders were making the trip to see this far-flung Asian shorebird. Similarly, I must thank Eric VanderWerf for supplying the photos he managed to obtain, as they make this entry less bland! This is conceivably the rarest bird I have ever found: a state first! I have had two provincial second records (Ross' Gull and Painted Bunting) and one third record (Lesser Nighthawk) for BC, but never a first. What a thrilling event and one hell of a way to end my first trip to the Hawaiian Islands! amazing adventure Jeremy thanks for sharing! Crazy bird for Hawaii; terrific find, Jeremy! A state bird for the ages. Mahalo nui loa (Thank you very much) Jeremy! Great blog! Jeremy, will you submit an article for Western Birds (Western Field Ornithologists) or 'Elepaio (Hawaii Audubon Society journal)?